February’s New Moon occurs in the sign of Aquarius and also coincides with Chinese New Year (Feb 5), the Year of the Pig. According to Chinese astrology, the Pig year favors generosity and abundance over strife and stress. This is a year to move beyond past limitations and pursue your goals. Also, developing a “live and let live attitude” facilitates health and longevity. Although February is the shortest month of the year, it allows us to take a deep breath and begin working positively with the new energies stirred up by the January eclipses. Whether we are finding “closure”, or opening new doors (often simultaneously), the New Moon in the sign of Aquarius helps us to move out of our old thinking patterns and explore new directions. VALENTINES’ DAY ASTROLOGY SPECIAL: Explore the important relationships in your life with astrology. Book two 60 minute readings for yourself or gift one $150; OR, combine an astrology update with tarot reading/ 90 minutes for $150. (Must be booked by Feb 20th, redeemable to mid June 2019. All New Moons are new beginnings, and the sign of Aquarius signifies the importance of community, collaboration and “group “consciousness. This year began on a note of national anxiety regarding finances, security, and government services. No matter what our political bent, this is not a time for divisiveness, but for working together to address the system’s flaws. Life, liberty and the pursuit of happiness for ALL is the Aquarian theme. On a karmic level, the sign Aquarius teaches humanity the lessons of balancing heart with Intellect; personal power with group mind. The sign Aquarius is the “Water Bearer” of the zodiac, but what he pours is not liquid, but energy. We receive the “elixir of the gods” as electromagnetic frequency. Our brains get “amped up”, and new neuronal pathways open. The brain and the heart must be connected (the signs of Leo and Aquarius, respectively) for the “new age” to occur. 2019 may still have its challenges as this transmutation process occurs; however, the core of enlightened consciousness remains intact. We, humans, are responsible for the New Earth we are creating. Let us do it through Love, Wisdom and Cooperation. This New Moon falls in the mental air sign of Aquarius, which symbolizes intuition and innovative thinking. Aquarius is the sign of the progressive humanitarian, the bohemian artist, the political reformer, as well as the scientist, computer whiz, and astrologer. If your sun, moon or rising sign is in the sign of Aquarius, you are probably a bit of a closet rebel, and this is your personal New Moon. Most Aquarians are usually very cool, calm and detached personalities, which make them very interesting to other people. They can also be great humanitarians working for a cause or philosophy, whether it is in the arts or sciences. Although they are “group minded” with a diverse array of friends, Aquarians often prefer to be alone. You can usually find them working on their computers, while in the midst of a crowded coffee shop. During this New Moon, we are more receptive to receiving (or giving) information on a body/mind/spirit level. It is a great time for an astrology reading, or energy healing session, such as reiki, crystal healing, acupuncture, or any of the modalities that address the subtle energy bodies. Trust your inner voice at this time. We all have a soul purpose, and an authentic Self, which differs from what family, friends, or society have imprinted on us. We all have responsibilities and duties in life, but self -expression does not necessarily have to be stifled in order to take care of them. Creativity comes in many forms. Voicing your opinion and taking a stand on something that you believe in can make a difference in the world around you. (Just be sure to allow others the same privilege). In this age of technology, our thoughts and ideas can be transmitted globally in a matter of seconds; so, it is important to remember that “with knowledge comes power AND responsibility”. The New Moon is a great time to set goals for the future and to expand your vision. Aquarius is all about evolution. This is the time to move past fear, break free of old limiting beliefs and breathe new life into your cells. 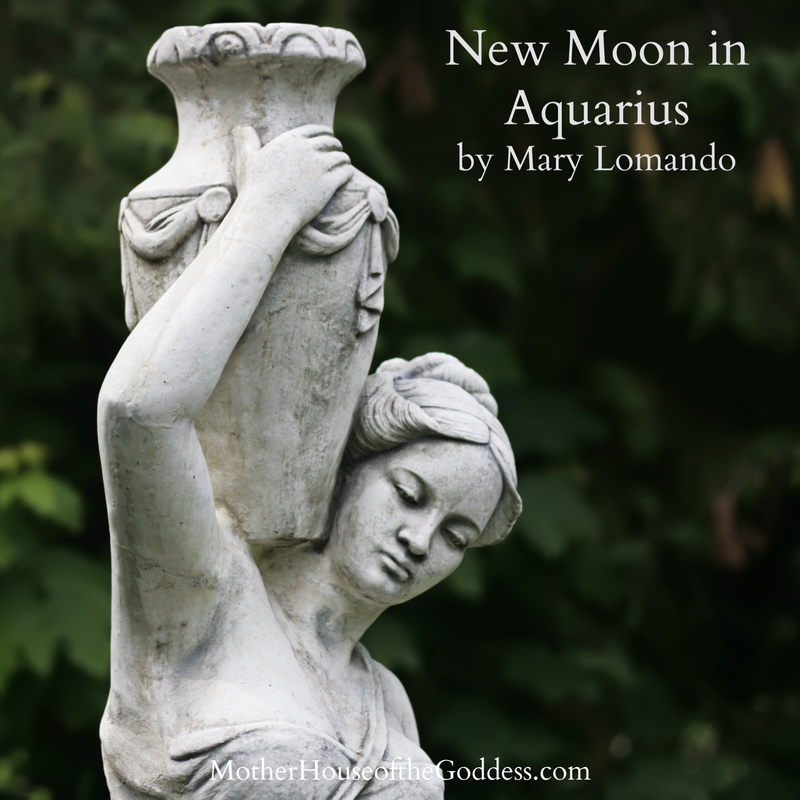 The message of this New Moon in Aquarius is “Know Thyself”. This New Moon has the three main personal planets (Sun, Moon and Mercury) together in the sign of Aquarius. All three of these are in a very harmonius aspect with the planet Jupiter in the mind- expanding sign of Sagittarius. The time is ripe NOW for new and innovative thinking, both personally and collectively. We will see major headlines announcing cutting edge innovations in technology, medicine, science, and even ET’s. As Jupiter is the “bearer of good tidings” with Mercury, a more positive outlook is on the way. It’s time to see the glass as half full, rather than half empty. Also, the planet Uranus is now retrograde and conjoining Mars in the sign of Aries. Over the next few weeks, we can expect some surprises with this aspect. Uranus is always present when major events affect the collective consciousness, and Mars in Aries takes no prisoners! Events spiral out of control when we, as individuals, cannot remain centered. Pluto in the sign of Capricorn is also adversely aspecting this Mars, which means there is often a karmic feel to the events unfolding. (Often, it helps to know where Mars is located in your birth chart to know how this will affect you personally). The key is to remain positive (Jupiter) and prepared (Saturn in Capricorn) while knowing that evolution is “in progress”. We are being “awakened” on many levels, as Jupiter in Sagittarius is also makes a positive aspect with Mars, hopefully raising the bar to one of global peace and optimism. In ancient Egypt, the sign Aquarius was associated with the Sky Goddess Nut, whose body arches over earth to form the vault of heaven and the heart of the Milky Way. In the hieroglyphic system, the sacred water jar was the symbol of the Goddess Nut. This key symbol, the sacred vessel, represents the womb of the Great Mother, the Grail of cosmic consciousness. 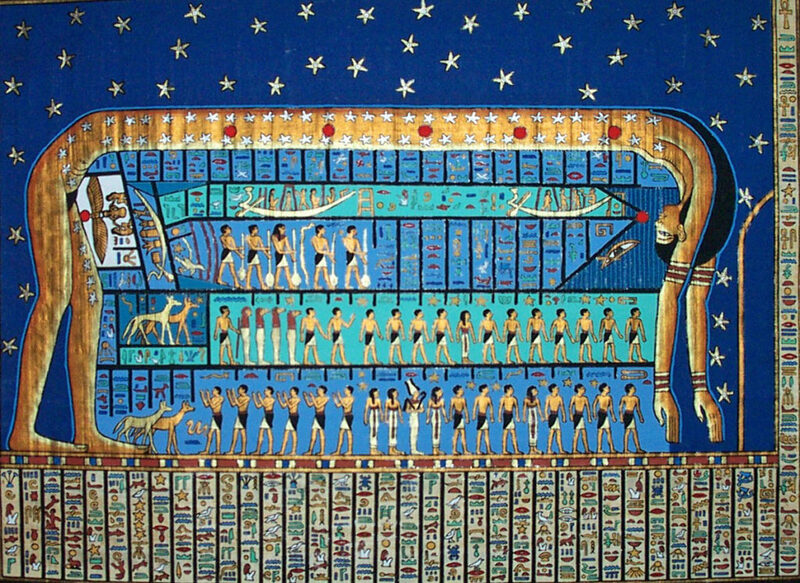 Inside her chapel at Dendera Temple, the ancient Egyptian New Year was celebrated as the star Sirius rose in the heavens. It was a time of renewal, hope and optimism; the Great Sky Goddess would bestow her blessings on the land through the abundance of the life-giving waters of the Nile. If Isis is the World Mother, then Nut is our Star Mother. Like the Star card in the Tarot deck, she gives us hope for the future. She is the harbinger of the New Age of Aquarius.